A delightful choice of Israeli wine, this Golan grown Cabernet Sauvignon is a wonderfully rich dry red. Kosher and fruity, this wonderful wine shows what growing on the basalt landscape of the beautiful Golan can produce. 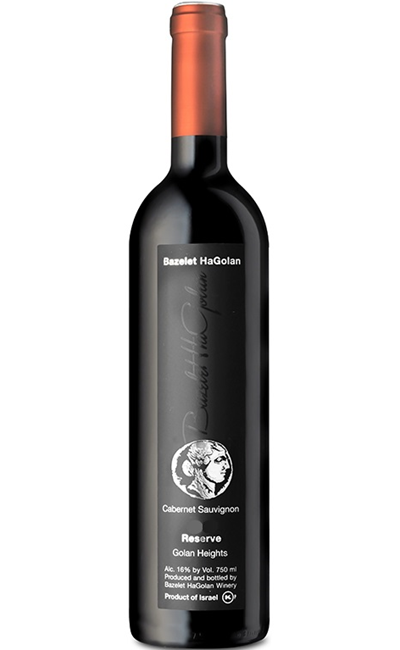 This lovely wine from "Bazelet HaGolan" (Basalt of the Golan) Winery is their stunning Reserve Cabernet Sauvignon. The stunning Cabernet Sauvignon grapes for this wine were grown on the basalt grounds of the Golan heights in Israel. Fermented in stainless steel containers, the wine is then aged for 20 months in barrels of American and French oak. The resulting flavor is a full-bodied, rich, fruity dry red Israeli wine with smooth tannins and a balanced acidity, plus the aroma of plums, gooseberries and wild strawberries.